Set in Grantchester, near Cambridge, in the early 1860’s, this fascinating historical novel tells the story of Bill Ellwood whose small, rural world is greatly changed when coprolites, the fossilised contents of dinosaurs’ stomachs, are discovered in the village fields. Mining companies arrive to dig for coprolites to use as fertiliser, wealthy landowners become richer, new people with new ideas arrive and the landscape and way of life change. Bill is a curious boy, fascinated by the natural world, and when one of his experiments causes his father to lose his job, Bill begins to earn money for his family by selling fossils that he finds. Then Bill makes an amazing discovery when he unearths the bones of a huge sea dragon, an ichthyosaur. Bill and his cousin Alf nickname the sea dragon “Croccy” and battle to keep the skeleton safe from thieves until they can sell it to a Cambridge scholar and make enough money to save their families. 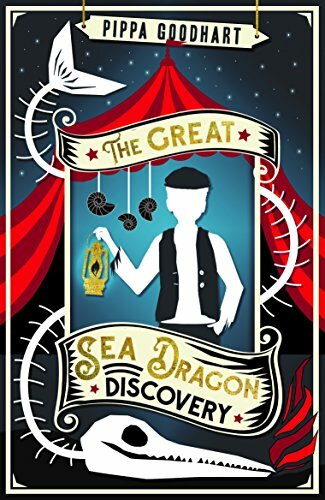 This is a gripping and heart-warming historical adventure story set during a period of great change when the ideas of Charles Darwin and the discovery of dinosaur fossils were causing upheavals in Victorian society. Bill, with his curiosity, intelligence and bravery, is a very engaging character who faces many dilemmas as he tries to bridge the gulf between his quiet, traditional village and the wider world of science and ideas. Many themes are drawn into this book, the conflict between science and religion, the gap between rich and poor, the inequality of the class system and the destructive nature of family secrets and lies. These themes are woven together in a skilfully written story with clever subplots, exciting and dramatic set pieces and a moving climax when Bill saves the life of his new baby brother and learns the truth about his own identity and place in the world. This is a beautifully written, poignant and thought-provoking book, full of intriguing ideas which link brilliantly with such curriculum subjects as evolution, adaptations and heredity. It is the perfect read for children who love adventure stories and are fascinated by history and the natural world, particularly dinosaurs and fossils.